2015 was extremely busy for UK metal band Left For Red. They now enter 2016 with the announcement of a new single ‘Utopia’ which is taken from that critically acclaimed album, accompanied by a UK tour that kicks off with a special launch show back at the 02 Academy in Birmingham. 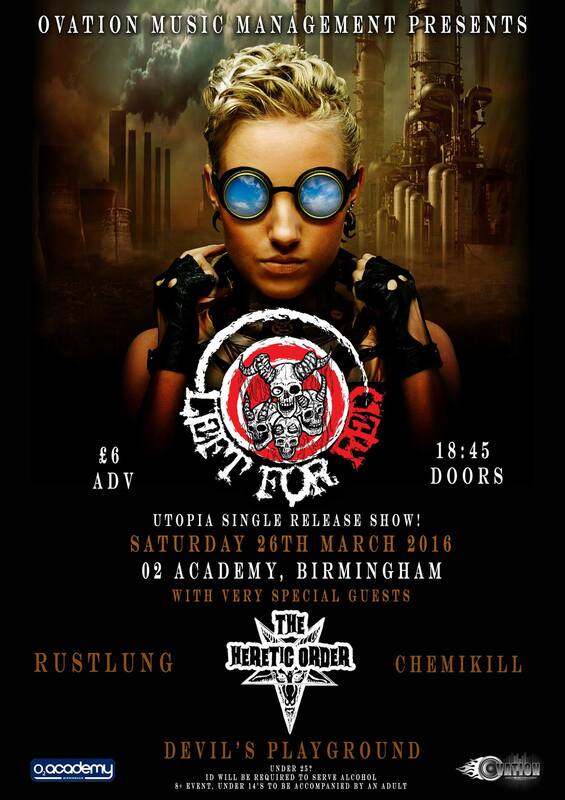 ‘Utopia’ will be released on March 26th 2016, the very same day as their launch show at the 02 Academy, Birmingham where they will be joined by very special guests The Heretic Order. The song is about a false utopian world that people have been made to believe is real, but when people are shown that their world is a lie, it’s too late and they cannot handle the truth. This poses the question whether they are better off living a lie. The story is equally matched by some splendid artwork for the single created by Andy Pilkington from Very Metal Art. Following the launch show, Left For Red head out on a UK tour which takes them to new cities whilst also visiting some regular haunts. We want to push Left For Red as far as we can and by doing this extend our live work into areas we have not played before but at the same time continue building upon our fan base, so we have purposefully selected towns and cities that we would like to turn up to and show them what we are all about! We are really looking to get out there and play ‘Utopia’ and the rest of All Things Known And Buried. Some dates we are headlining while others we will be playing alongside some rock and metal legends, like Diamond Head and Onslaught. We are going to have a blast!